It’s hard to explain exactly why but day break is my favorite time to ride. Birds seem to chirp a little louder. Dew from the nights rain some how mixes perfectly with the smell of exhaust fumes. Morning is calm, it’s welcoming, it’s perfect in a way that’s hard to explain. It’s perfect for riding a motorcycle. I’m never disappointed when I swing a leg over the bike before the suits make a rush to the office, before the motorhomes make a dash for the scenic roads. On this day, I’m especially pleased be to on the road early as I make my way over Trail Ridge Road in Rocky Mountain National Park. If you plan on riding in a National Park you can assume a few things. The scenery is going to be stunning and the roads are likely to be nicely paved. It’s also safe to assume you’ll find a few motorhomes and selfie sticks. For National Parks in general, go early, go slow and go somewhere else before the sun gets high and the crowds get restless. Such is the case for Trail Ridge Road near Estes Park, Colorado. Trail Ridge is one of the most visually stunning stretches of asphalt in the world but sucking diesel fumes from a 30ft pusher really puts a damper on the views. Time it right and you’ll be arching turns up the mountain before the Denny’s crowd gets their coffee. And just like the anticipation of the rising sun you’ll climb towards the clouds in route to a view that pictures do no justice. 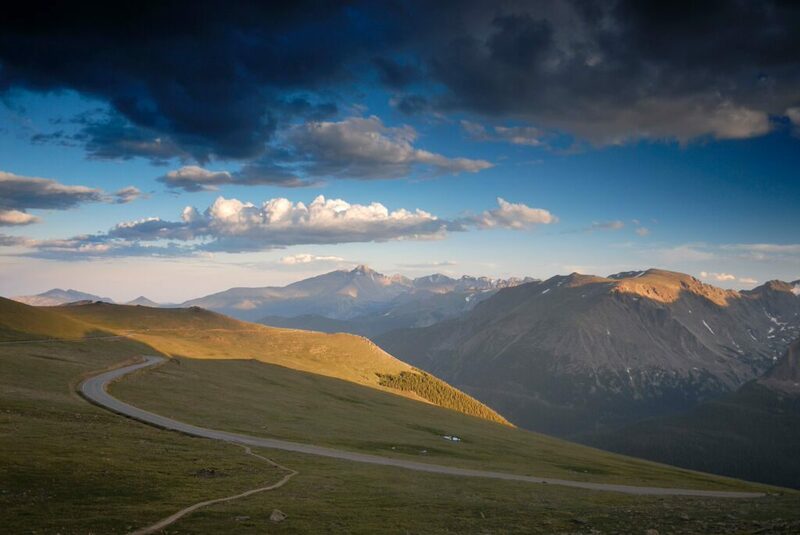 Take a little time to soak it in, take a little more to manage the switchbacks that wind through the alpine tundra. Some folks call this Gods country. It’s not hard to see why. I just rode Trail Ridge Road 2 weeks ago today on my trip from MN to NM on my BMW R1150 GSA. Could not agree more, get on the road early in the day. Also recently ordered 11 of your maps and will be using a bunch of them shortly on my 31 day ride to the Pacific Northwest from MN. Thanks. Nice job that makes all my planning a bit easier. Thanks Darrell. A 31 ay trip the North Wet sounds awesome. You’ll be please to know that our OR map is coming out next week. Followed in Aug by our WA map. I live in Eastern WA and the time before dawn is my favorite for all the reasons mentioned plus – its before the heat of the day and before all the juicy bugs are swarming on the roads. Somehow, wiping bug guts off my visor just does not improve the ride one bit. Excellent write up. I rode this a few years back, but didn’t get the memo about the early morning thing. They were doing some kind of construction to boot. Sitting on top waiting, I thought the wind was going to blow my bike over sitting on the side stand. Beautiful drive though. Just don’t forget coming up the original road. Nice dirt/pavement alternative and some nice views that way. Lots of bull elk the day I went through. If you ride the Trail Ridge Road in the late spring, you will encounter snow piled very high. I rode it in June 2008 and had to hike from the parking lot at the top to get a view unobstructed by snow banks. It was FABULOUS! Temperatures were in the 80s down in Loveland on the ride out. Amazing. Beautiful road and yes early is the best time. Made a round trip out of the ride by taking the Fall River Road to the top. Easy gravel and far less traffic. Added to upcoming 30 day ride. Whether I can make it an early morning ride TBD. I’m heading out that way from nor Cal this September for the KTM rallye in Crested Butte Colorado. I will make it a destination ride. I can’t wait to get out of the rat race for a couple weeks !!!!!. This ride looks really great. 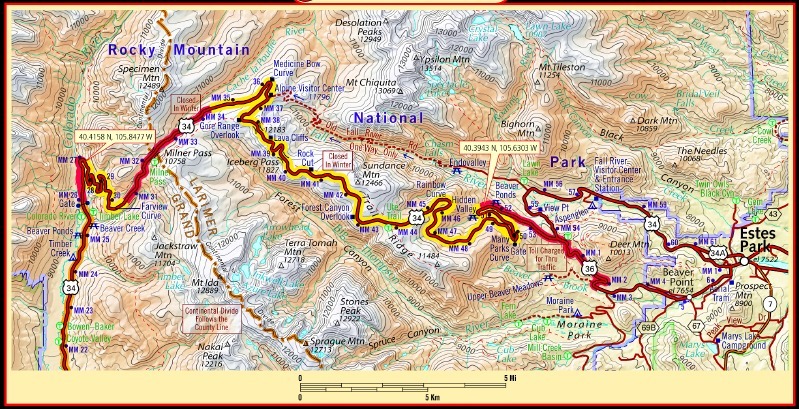 I will be riding from Billing, MT to Gunnison, CO for my class reunion. I will plan doing this ride in early August. Thanks for the tip. Animals are not near as flighty in the early morning hours as they in the early evening hours. Another reason to ride early rather than late! Last time I rode Trail Ridge Rd was about 20 years ago and my bike didn’t have a motor. Great picture of Trailridge road. Brings back memories Have skied that particular place in the winter Rope Tow only. First Light is the very Best part of the day, especially when you are spending your day on your Motorcycle! Are Motorcycle Maps Really a Must Have?